Traveling to a places means a lot more than most of us actually do. For many of us it is limited to the popular and more known attractions than unknown, unusual or mysterious. Traveling to a place which is truly strange, mysterious, weird or just unusual is as exciting as it sounds. 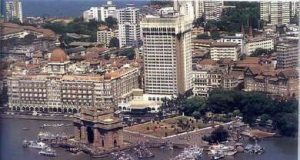 If you want to see some of the most unusual sights that India has to offer just read on and browse through the following list. 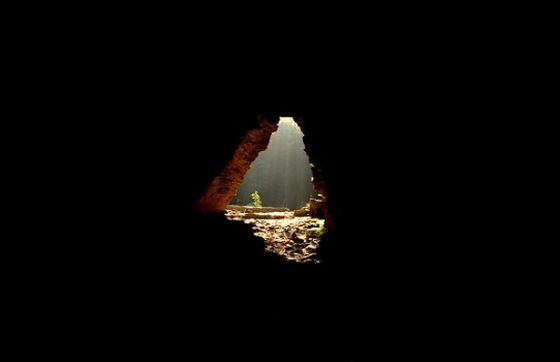 These caves are located in Tamenglong district in the North Eastern State of Manipur. The caves are one among various historic sites of Manipur. The caves also provide the first concrete evidence of Hoabinhian culture in India which is also found in other South East Asian countries. Thalon caves are located about 910 mtrs above sea level and its an unusual experience when you enter. The darkness and the frightening experience feels like you are entering into the unknown world. It is truly a magical experience when something just disappears right in front of you. The thing which was right here and then just vanish after some time. This is what happens in Orissa. The hide and seek beach of Orissa that appears and disappears with every high and low tide. With every low tide, the sea water recedes to approximately 5 kms and hits the surf of the shore back during high tides is the captivating sight at the Chandipur Beach at Orissa. This hide and seek amuses various travelers. Have you ever wanted to go to forest or in some kind of magical places? Northeastern India is one such place where the majestic environment will give you a unique experience of its kind. Living tree root bridges are the specialty to the Cherrapunjee region, the wettest land on earth. 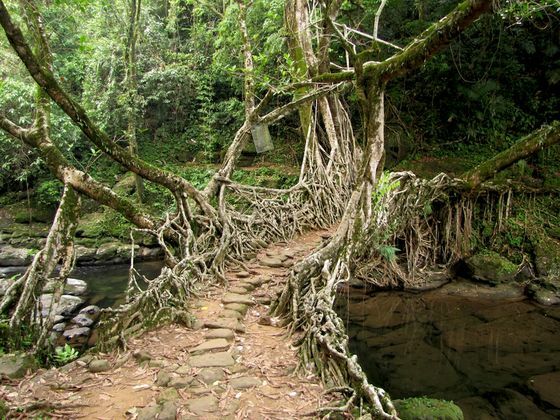 The living bridges of Cherrapunji, India are made from the roots of the Indian Rubber Tree ‘Ficus elastica’ tree. It may sound magical or even exaggeration; the root bridges of Cherrapunji are really alive. Unlike any other part of the world these bridges are grown, not built. 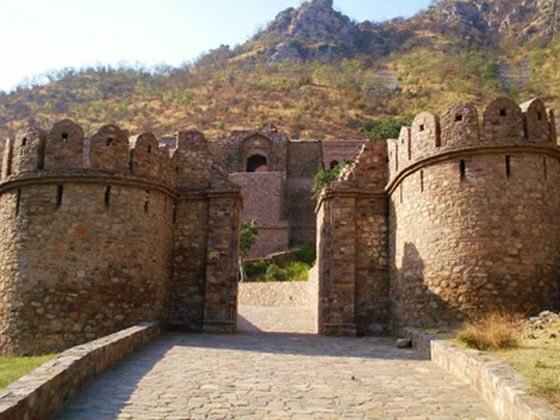 The ruins of the Bhangarh, in Rajasthan are known for being the most hunted place in India. We know that not all of us believe in ghosts, but there are warnings at all the entry points to the Bhangarh fort advising people not to venture into the city at night. Signs have also posted by the Archaeological Survey of India (ASI) strictly prohibiting the visitors to enter the fort before sunrise and after sunset. The sign explains that if any individual is a ghost hunter or loves to explore mysterious places then Bhangarh fort should be a must visit spot. Umri (a village) is the producer of largest number of twins in the world. Umri can be referred as the village of twins. 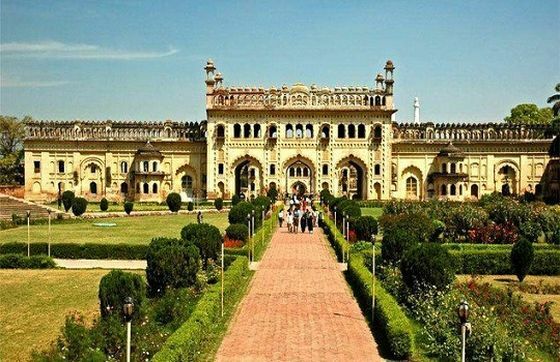 A small village located near Allahabad is famous for its unusual twin population, which is not only limited to humans but animals too. 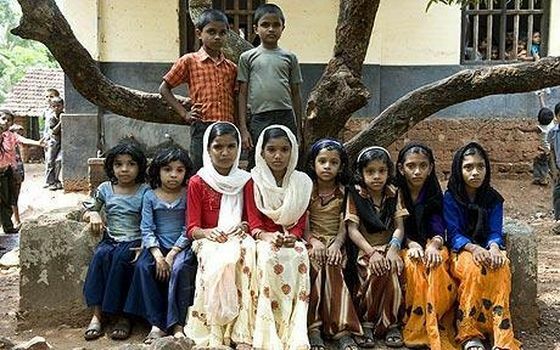 There are 120 twins living in this village of 2,500 families. 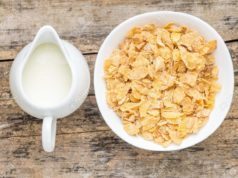 The village boasts a twin monozygotic (MZ) or identical twin birth rate that is 300 times the national average and perhaps the highest in the world. Shivapur is a small town in the state of Maharashtra. The village is famous for its levitating stone that mysteriously levitates in accordance with a Muslim Sufi mystic who lived six centuries ago in India. 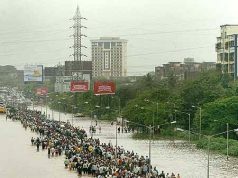 Shivapur is located about 180 kms east of Mumbai. According to a legend, A saint named ‘Qamar Ali’ on his deathbed said that ‘when 11 men place their right index fingers under the stone and then jointly call my name, I will cause it to rise higher than their heads.’ And this actually happenes. The stone is still there and it still levitates. The uncommon phenomenon here is that the car moves itself when put in neutral gear. The car moves up a steep mountain road at a steady speed of 10km/hr or above depending on the type of vehicle. It is a hill near picturesque Leh. The hills have magnetic properties which attracts metallic objects, making vehicles move up at a speed of about 20 km per hour. 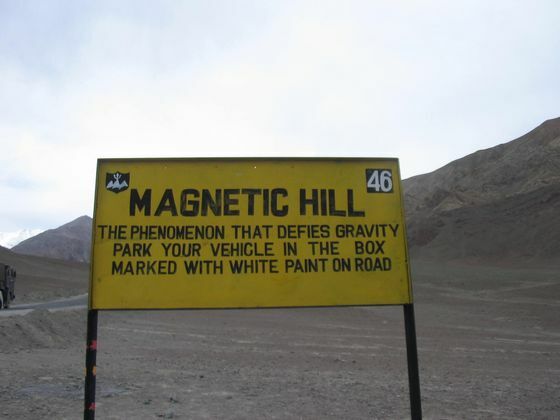 The “magnetic hill” is located on the Leh-Kargil-Batalik national highway, about 50 km from Leh, at a height of 14,000 feet above sea level. Today the places has become a popular sight seeing place where tourists are amazed to see their car moving on its own. 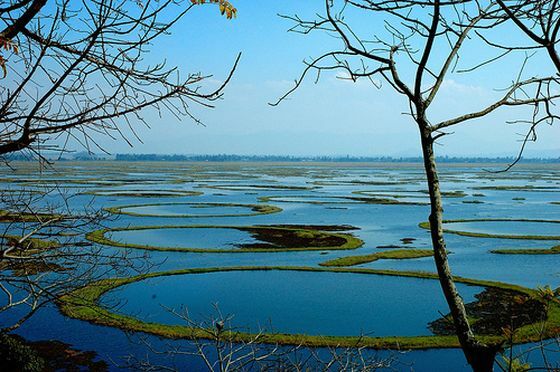 Loktak lake located in Moirang about 48 km. off Imphal in Manipur. 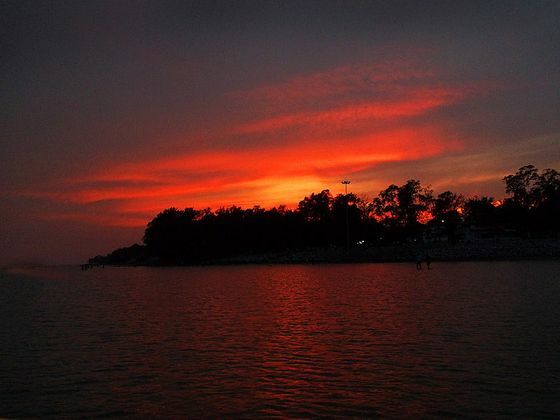 It is known as the largest freshwater lake in North-Eastern India. The lake became popular because of the presence of floating islands known as Phumdis. These Phumdis are heterogeneous mass of soil, vegetation, and other organic matters. 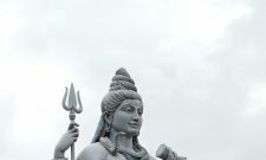 Lepakshi is a small town, in Ananthpur district of Andhra Pradesh state. 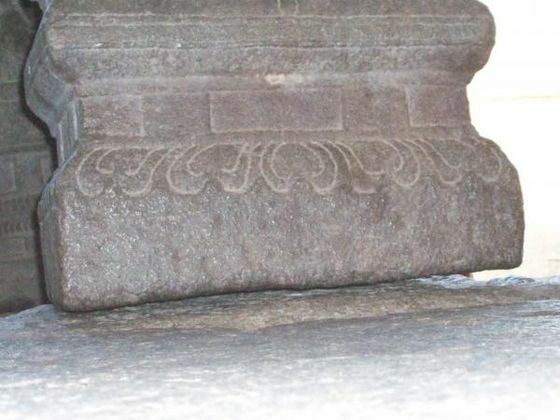 The most unusual thing related to Lepakshi is its floating pillar. 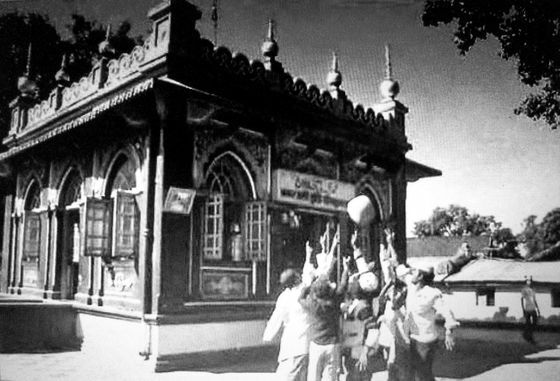 A pillar which is believed to be attached with the ceiling but not to the floor. Though it is popular as floating pillar but it is a Hanging Pillar.There is enough space to easily pass a sheet of paper a towel underneath.